Electricians are in high demand – higher than ever before. Construction is at an increase while the sector recovers from the recession, causing in influx of job opportunities for electricians of all disciplines. The green movement is also adding to this, as companies and private individuals turn to more economic power usage. Electricians are replacing old wiring systems, installing new ones and even maintaining economic appliances. It is also estimated that the electrician job market is to see a 20% increase (or higher) in the next few years. If you are thinking of starting a career as an electrician, now is the time to do it. But how should you go about it, and how long does it take to get a license? This quick guide should send you on your way. 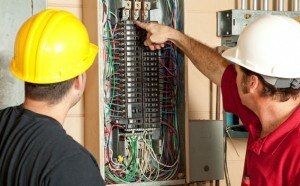 The first step toward becoming a journeyman electrician is deciding on a school that suits your needs. Research your local schools and ask a licensed electrician for advice. It may be worthwhile to look outside of your own State, especially if the schools are widely recognized and offer a variety of training disciplines. A journeyman electrician is often considered to be a general electrician, but some schools offer extra specialization courses as part of your training, which could all come in handy if you decide to specialize later on. Also check whether the school you have chosen offers apprenticeships as part of your course. Finding an apprenticeship is the next step, so it helps if the school will provide you with both. You need to have graduated from a reputable school, and have completed a recognized apprenticeship if you are to get a license as a journeyman electrician. Most apprentices choose to complete these two steps simultaneously, which takes an average of four years to finish. Apprentices are usually paid per hour as well, so you will be able to earn some money while you study. After completing your apprenticeship and graduating from your chosen school, you will need to obtain a license to operate. You can get this from your local authorities, who will also be able to tell you the requirements for obtaining a license in your State. How Long Does It Take To Get A Journeyman Electrician’s License? This depends on your specific State, and your personal performance. Each state has unique licensing requirements. You will need to find out what your State requires by getting the information from your local authority. They will be able to tell you about the specific codes that the State adheres to, as well as the testing schedule. Once you have gained the info, you will have to start studying the local codes and regulations. Most American States make use of the National Electrical Code (NEC). This will take some serious studying on your part. Exams differ across the States, so find out what you are to expect (the formats can range from essays to monkey puzzles). Some States allow you to use your NEC handbook during the exam, so find out if this applies to you as well. After you have completed and passed your exam, you will be issued a license to work as a certified journeyman electrician. How Long Does It Take To Become A Journeyman Electrician? You need to take into account that it takes a good many years, and a lot of dedication to become a journeyman electrician. You will be studying, and working long hours at the same time as you complete your apprenticeship. The work can be physically taxing, as you will often be climbing up and down ladders and scaffolding. However, if all goes well, you should have completed both your studies and your apprenticeship within four years. Depending on your local licensing exam schedule, you may be able to gain your license soon after. This is all relative, however, and depends on the individual’s performance and their State’s codes and testing arena. It is safe to say that, from beginning to end, you should be done and dusted within five years’ time. Being an electrician is a highly rewarding job. You work in a constantly changing sector that is growing as we speak, and the skill is in high demand at the moment. To be an electrician, you need to have an aptitude for problem solving and a love of working with your hands. You need to be able to handle power tools, and you need a solid understanding of all things related to electricity. You also need to be creative and able to think on your feet. An eye for detail also helps, as you will need to be able to diagnose faulty systems. If you are creative, tech-savvy, hard-working and analytical in your approach to problems, becoming an electrician may just be the right choice for you. This entry was posted in Electrician Job Description, Electrician Jobs, Journeyman Electrician on March 15, 2014 by admin.